빌뉴스, 리투아니아의 렌티다 게스트하우스 | 호스텔월드에서 예약하세요. 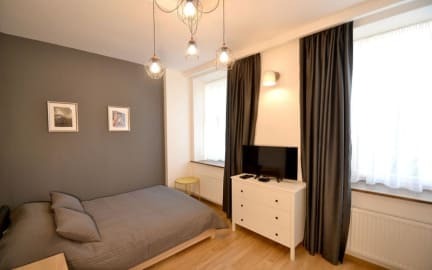 We present you our new and unique project Rentida Guesthouse- Rental of inexpensive, but cosy furnished rooms in the newly renovated building in Sodų Street 5, Vilnius. As the history says, in the middle of the XVI century the first guest house was created in this building, which was supervised by a well-known city merchant. Of course, the building has been repeatedly repaired and rebuilt, but we have kept its unique interior and many details that will take you back in time for more than one century. 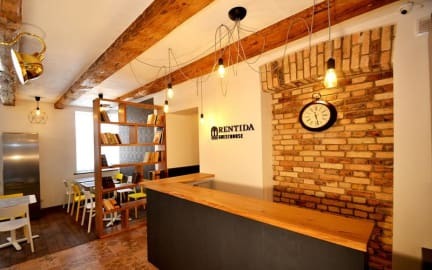 Rentida Guesthouse is located in Vilnius, 0.4 miles from Bastion of the Vilnius Defensive Wall and 0.9 miles from Gediminas' Tower. Lithuanian National Opera and Ballet Theatre is 1.8 km from Rentida Guesthouse, and Museum of Genocide Victims is 1.8 km away. The nearest airport is Vilnius Airport, 3.1 km from the property. Rentida guest house has 12 cosy rooms and a large shared kitchen with a seating area for all guests. Also there is a cosy patio, where you can make a barbecue or just relax hiding from the bustle of the city. In each room you will find a shower with a toilet, bed with linens, towels and a wide-screen TV with a digital television. During the day the receptionist will help you to check-in and provide useful information about entertainments in the city. Payment upon arrival by cash, credit cards, debit cards. This property may pre authorise your credit card.